Aah, summer is here and the fish'n is good. Summer vacation crowds have tapered off a bit to normal levels after the Fourth of July weekend so fishing pressure is not bad, not bad at all. Temps have backed off to mid 70s to low 80s from high 80s earlier this month. Winds are mostly mild with some gusty days up to 20-25 mph and are generally in a northernly direction so shelter can be found at the southern end of all lakes in the Loop. In addition to the following reports all lakes are fishing well from boat or shore with night crawlers, power baits, mice tails, and pinched crawlers along with popular lures and flies. Mornings and evenings are best with mid-days still producing in deeper cooler water. 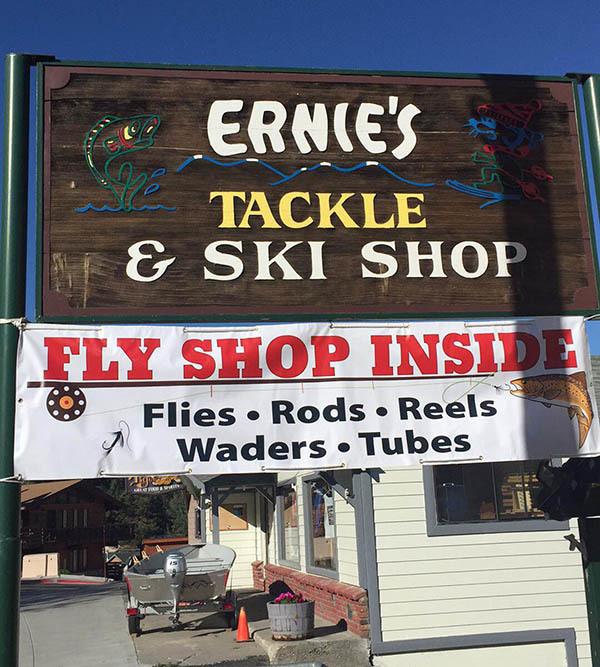 Conditions and methods can change daily so when visiting the Loop it's advisable to check in with our local tackle shops and marinas for the latest "what's working", locations, boat rentals, trout plants, etc. Trout Plants: Ca. Dept. of Fish and Wildlife is stocking all waters weekly with Rainbows in the 12" range along with some occasional "Trophies". As the season goes along this builds up resulting in plenty of fish available into October. In addition to this weekly schedule Mono County and the Marinas themselves dump in loads of larger Desert Springs Rainbows brought down from Oregon outlined in this report. Grant Lake: Trolling is best bet for bigger Browns and 'Bows as deep as 8-9 colors lead core dragging Taz Bloody Rippers, Thomas Buoyants, black and silver Rapalas, etc. A 6-11 Rainbow was hauled in last week with a Buoyant. Due to the high lake level shore fishing is best at Privy Point, east side via dirt roads, and some drive to spots in upper sections. Rush Creek inlet area is excellent with tubes, kayaks, or a rental boat from the marina. Oregon fish are due this week and next week. Rush Creek: Creek is still flowing strong but less than its peak earlier this month. Salmon eggs are working well along with Sierra Slammers, Thomas Buoyants red and gold, Vibrax lures, and night crawlers. Fly chucking with Wooly Buggers or a San Juan Worm with an egg pattern dropper are getting some grabs too. Check out the big fish book and photos at Silver Lake Resort for more Creek info. Silver Lake: Water temp has risen slightly improving the catching. Lake level is still high reducing shore fishing to roadside near Resort and marina. There's a hatch appearing in mornings when winds are calm so this is a good time to be out in a tube or kayak tossing flies. Put in at the day use parking area near the south end of the lake. Tom at the dock suggests boaters hit the east side along the cabins to the island trolling red and gold Buoyants or brown trout Rapalas. Some nice 4 to 5 pound Rainbows and Browns have found there way to a stringer in the same area hitting on night crawlers, white and pink mice tails, garlic power bait, and garlic pinched crawlers. The Resort put in Oregon 4 to 7 pounders this week with future drops in Aug, Sept, and Oct.
Gull Lake: Gull has been kicking out a steady stream of DFW planted rainbows mostly from boats near the campground and back bay. If you look in their big fish book at the marina there's been some nice 2 to 5ers caught dropping in salmon peach and garlic Power Bait. Trolling is scoring with Buoyants and Needlefish 3 to 4 colors. Oregon 5 to 10 pounders were put in last week with more coming next week. You'll see me out there try'n to get one! 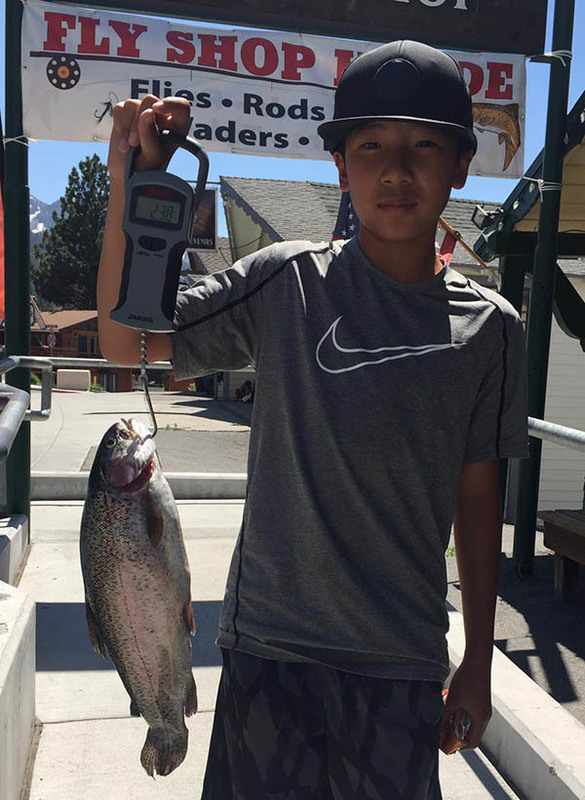 June Lake: June is pretty much the best choice for shore anglers since most of it is easily accessible. Throw out the usual baits and lures. Boaters have been hauling in "stockers" near the marinas and northeast end. To hook up the bigger Rainbows and Cutthroats during mid-summer you gotta be trolling 7 to 9 colors lead-core and even deeper with down riggers. "Silver", one of our locals has been git'n 'em lately at about 7 colors with red and gold Phoebies and hanging a night crawler on a Wedding Ring. Needlefish and Tazmanian Devils are go to as well. Abby at June Lake Marina tells me 5 to 7 colors morning, 8 to 9 mid-day. June got a load of 3 to 5 pound Oregonians recently with more due in Aug. and Sept. Fly Fishing: Fly casting in tubes, kayaks, etc. is working on all lakes. Head for the sheltered areas if wind kicks up. In the early mornings when still calm fish the surface with dries including elk hair caddis, stimulators, mosquitos, flying ants, gnats, and light cahills. As temps warm up and a wind chop develops go deeper to 25' with full sink line dragging streamers and buggers. Try adding a scud or hares ear dropper. Local hike in lakes are good for smaller brooks. Practice your roll casts so you're not limited by trees and bushes. Catch and Release: Please utilize catch and release methods for the Loop's resident Browns and Cutthroats to keep populations at healthy levels for future generations. A trophy mount can be made by a local taxidermist from photos and measurements.